Thank you to everyone who made this year's Pancake Party so great - those who came and those who helped! Such a great opportunity for us, as a church, to get to know those who live in our neighbourhood and them us. And we pray we will see many of these people again and again and again! Check out some of the fun we had at the 'Little Gems' Toddler Christmas Party this year :) Photos taken from one of our mum's - Silvia, thanks for sharing! On Sunday morning Bill read a poem he had written about his journey to faith ("testimony"). He was happy to share it with everyone online. It is called, "The Right Path"
When, Lord, I gave my life to You. Ended right here at Albert Road Church. Though reluctant to go, I had no regret! I needed to change: there was much to prove. Reading the Bible and hearing God’s word. We learned about Jesus – here in this place. To lead us to know of God and His love. For us to become Christians – for us to be saved. In Baptism’s waters we came to the Lord. As we pledged to Jesus to walk in His way. When I think back on all of my wasted years. Our marriage was blessed – that also was here. Thanks be to God: our lives are complete. But for the right path I’ve chosen – I am so glad. Mean for me things will never again be the same. And I long to serve Him in all that I do. My testimonial has now reached its end. I’m so glad that You came and gave me a call. And thank you for listening! God bless us all. 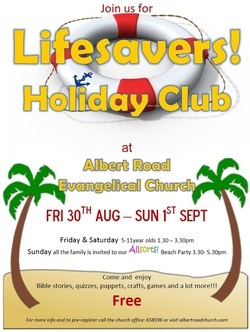 We're getting ready for this year's holiday club - Lifesavers! A fun-packed club for all 5-11year olds, 1.30-3.30pm on the Friday and Saturday then a special 'Allsorts!' Beach Party for the whole family at 3.30-5.30pm on Sunday. It'd be great to have an idea of numbers coming - so if you would like your children to come, or know of friends children who are coming please drop us a reply. But ofcourse, you'll still be welcome on any of the days if you don't know till nearer the time! Yesterday, the signs showing our new logo and details went up at the church. Not only have we now a fresh new one on the front of our building, but everyone coming down Castlefields will also know we're there and what we're about. We're very proud of our new tag line: 'Holdinging on to Jesus, Holding out his love'. Newcomers have been invited for Tea and Cake today. This will be a time to meet together and meet the leadership. Find out more about what goes on at Albert Road Evangelical Church - who's who, how to get invovled, how you can become a member - and ask any questions you may have. We thank God for all His blessings especially the numbers of new people recently attending here. Please pray for this event. Tuesday 12th February we met to enjoy a great big feast of pancakes and play lots of very silly pancake games! Check out the photos of some the fun we all had and we look forward to seeing lots of you again at future events or services at church! Photos from our Family Nativity Service and shared lunch.